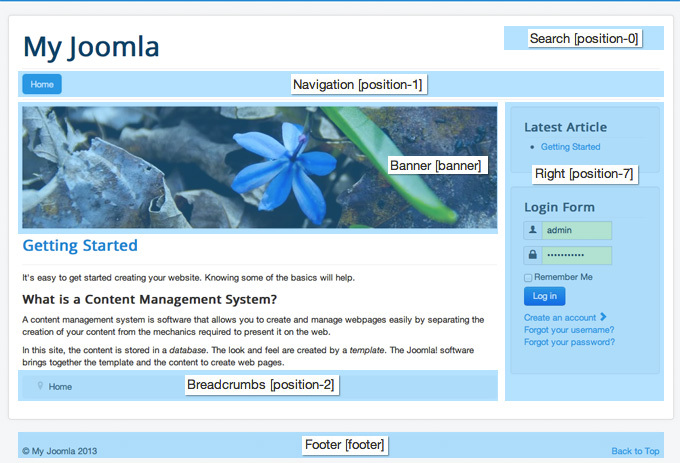 Today I will introduce you more about Joomla 3 positions and how to use them. Each Joomla template has locations that appear different modules such as menu, login form, search form, and so on. It depends on which template you are using, where they are placed and their appearance. 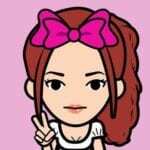 In the default data there is no content in the left column or space above the first post and is used by the developer to check the code or display the debugging information on the footer. To add a module to the page, go to Extensions -> Module Manager. You are required to add some information to the module. Select the title and select the module shown in position -0. Click the Save Green button. To change the position of a module, first login to your Joomla admin page and go to Extensions -> Module Manager. You will see a list of modules. Find the latest Articles module and click on the name. If you are having problems, then use the search filter at the top of the table. 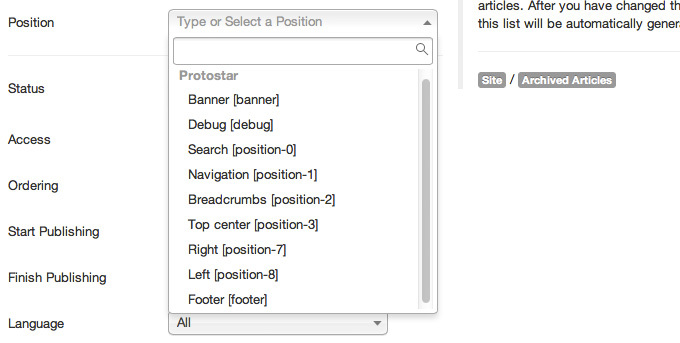 On this page, locate the Position drop down menu and click on it. You will see that a list of the available positions will appear. That’s it, you can now go to the front end of your website and see the Latest Article module showing in your left column. You have two modules published as the search module and the newest article module. 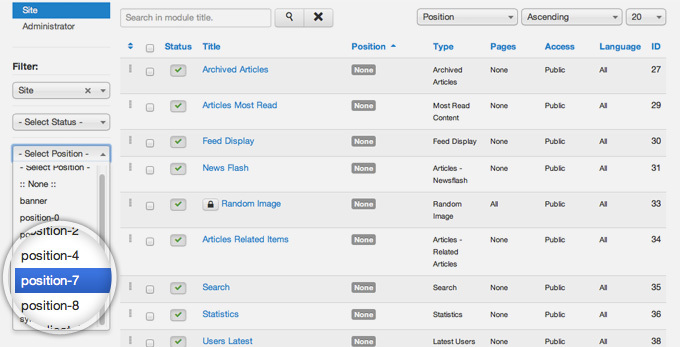 To move the search module above, go to Extensions -> Module Management. Now, choose position-7 from the position drop-down filter in the left column to display only the modules, published into your right column. Next, you need to sort that table by its order. To do this click on the Ordering tab and select Sort table by: Ordering. Then, simply click on the three small dots in the first column of the table and then drag-and-drop the line for the Search module, above the Latest Article one. Once you do that, go to the front end of your Joomla site and you will notice that the Search module has moved above the Latest Articles one. The module location is defined in the sample code and each designer can name different locations. How to find out the available positions in the template you’re using? 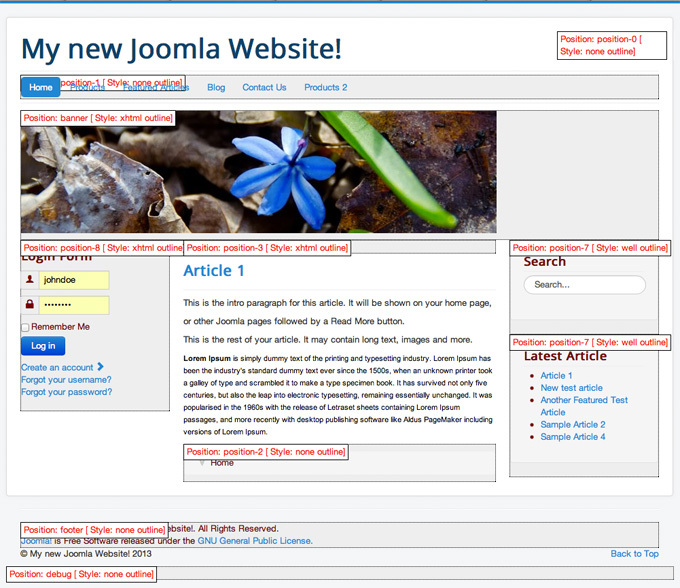 To find out the name of any Joomla template location and their location is at the top of the interface. Go to Extensions -> Sample Manager. Finally, go to the front of your website, and add the index.php?tp=1 option at the end of your URL. You will see an output similar than the one on the screenshot below.